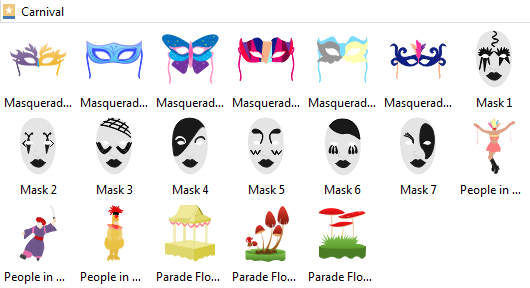 No more struggling with what to use while deisgning cards, here are all the ready-made card design elements available on Edraw now! Get an insight of types and their uses. Why Elements are Important for Card Designing? When you present a card to people, the first thing that comes to mind is the design of the card's colors, layout, and font. The content of the cards are certainly important, but obviously it's the design that creates the first impression. For example, a great business card can be used to make a connection, or simply communicate your personal information. If you want your business card to be interesting and effective, you should pay attention to the elements that you use. This page will give you a guide about all the elements related to card designing. Our professional design team has elaborately prepared a great range of amazing card design elements. Different topics have a different group of elements. Users can easily modify the size, color and shape of these elements. Included are certificate elements of various styles. Create your own certificates with these certificate elements. In the "Certificate Elements" library, there are "Head", "Element", "Corner" and "Line". You'll love being able to design your own certificates with these beautiful certificate elements. The gift voucher elements are a simple, fully customizable feature of Edraw. Within just a few clicks you can have a customized certificate for any gift vouchers. The "Gift Voucher Elements" library is on the left side of the drawing page. Feel free to have a try! The design of business cards can vary depending on industry and position, but it's always a great idea to keep the layout beautiful and easy to understand. Because they are a great way to give a visual first impression of you and your organization. There are many ways to get a well designed business card, and using good business card elements is certainly one of them. Displaying all kinds of free vector matching birthday card elements. Various sets with vector birthday card design elements to create your own unique card and invitations. Birthday candles, cakes, birthday hats, and candies and card template and contained. Go ahead and design a specially made birhtday card for your loved ones. You can design a printable Christmas card by using some of the pre-made christmas card elements. These elements will help you decorate your card with a variety of border styles and photo layouts. You can also add text to describe your wishes. In this library, all traditional christmas elemetns are included, bells, balls, Santa Claus, christmas trees, etc. Here are 19 carnival card elements perfect for invitations, blog, web design, graphic design, printed paper items, and so much more! with all the elements, it is super easy to customize, change color, size and add text. Start designing your own carnival card, bring your craziest friend and get ready to PARTY! Celebrate this Children’s Day by designing a picture of a wonderful memory and share it with your child. If you are trying to find some useful elements for your own card design, this free "Children’s Day Card Elements" library will be your best choice. 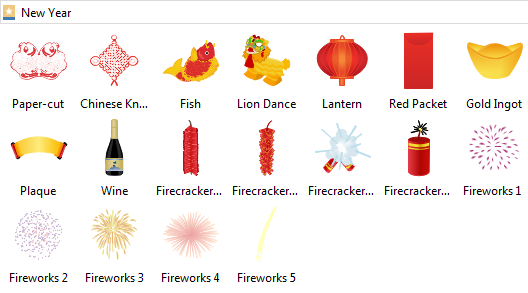 Because it has all related elements, such as boy, girl, toy, clown, mask and ballons. You can design a beautiful Easter card by using some of the elements created by our professional designers. These elements will give your card a unique and special layout. In this library, all traditional Easter elemetns are included, easter eggs, bunnies, chicken, cake, candles, basket, etc. It's Easter day! Start your spring by sending your friends a lovely card. Big set of Halloween elements for your Halloween cards. 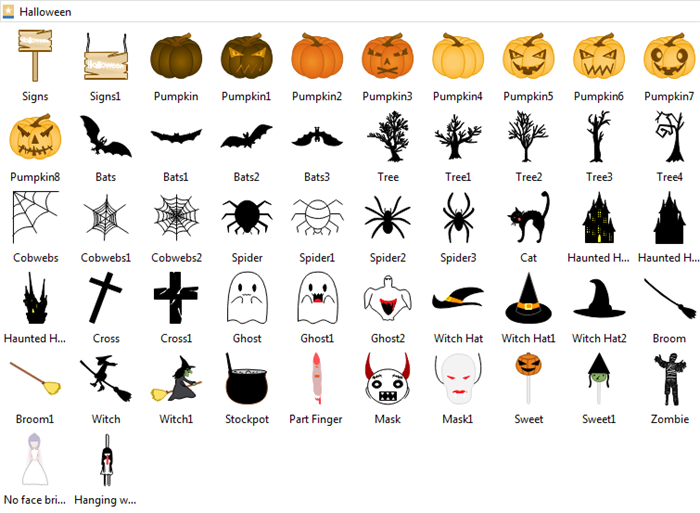 Including various Halloween Icons and Halloween Badges. All you want for Halloween is here, pumpkins, bats, ghosts, withch hats and haunted houses. Are you ready for Halloween? 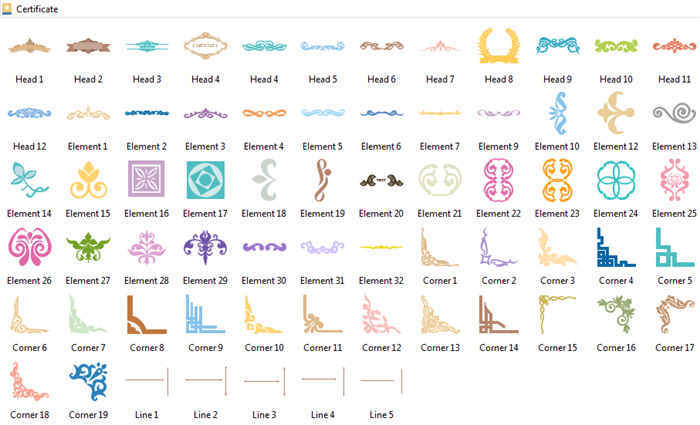 All elements shown in the "New Year Element" library are 100% customizable and free for download. Use the design elements library "New Year" to create your own unique greeting cards or New Year's Resolution card, you can send them to your families and friends, and also you can post to social networks, blogs and websites, send by e-mail. 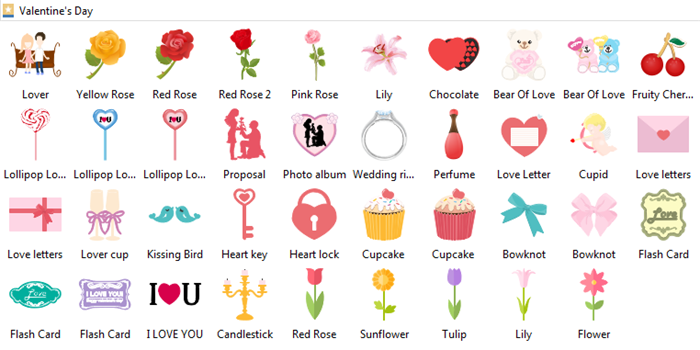 Creating your own Valentine's Day cards with this professional design software will provide you with a wide array of options for choosing your images, text, and other graphical elements. Within just a few minutes, you've got your own homemade Valentine's Day card! If you love some, get her a card and let her know! Discover why Edraw is an awesome card design tool: Download it Now.